Project management is rarely easy. But this guide helps you understand project management while you use Project. Each link below goes to a page exploring that aspect of project management with articles and short tutorials. The more complicated a project gets, the more you need to plan before you start using Project. During the initiation phase of a project, use applications like Word, Excel, and SharePoint to help you with your thinking. Projects often fail without enough early thinking during an initiation phase. At this point, think about who your stakeholders and sponsors are, while you draw up charter statements, early specifications, and perhaps a budget. 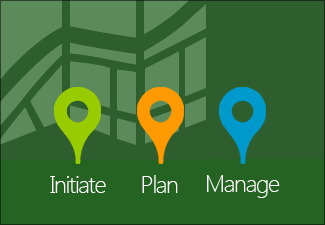 For smaller projects you can do much of this work in Microsoft Project. For bigger projects, use Word, Excel, SharePoint, or even your phone to capture your thinking. Maintaining communication channels with stakeholders isn’t always easy. But it is critical to the success of a project. To help with the time-consuming part of communicating, Project has numerous reports that are only a click away. Capture early plans, major project milestones, budgeting requirements, staff needs, and so on. After you’ve completed your initial thinking, it’s time to start Project and create a new schedule. You can start with a blank project, or use templates that other project managers have created—some by experts in project management or in a business similar to yours. Tasks are the activities that get done in a project. Learn how to add tasks, change their properties and estimate their durations. When you first add tasks, they might not be in the best order for managing them. Learn how to organize them by using summary tasks and subtasks, and by linking them. After you’ve added tasks to your project, think about the people you want to work on them. Keep in mind, that adding people and assigning them to tasks are different activities in Project. To help manage people across multiple projects, place all the people in your projects into a single project file. This file works as a resource pool. From the resource pool file, you can share resources across multiple projects (without Project Server). Handling project costs can be intimidating for any project manager. With Project, you may discover that this work isn’t so difficult at all. Learn tips to help you stay on budget. Your work doesn’t stop after you build a schedule. Managing your project takes more time than building it. For example, tasks change, people get added, the end date needs to move back in, and so forth. With Project, you have all the tools to monitor progress and make changes to ensure a successful outcome. To cut through the complexity of your schedule, find the right view. The Gantt chart gives you one view of where your project is going. You can also use a Calendar view, network diagram, or timeline to help you see different levels of detail. After you've created your initial schedule, it’s time to start seeing how things are going. Creating a baseline and using the right views will help you keep track of your project's progress. Tracking progress can seem complicated, but here’s a quick way to show percent complete using progress bar on a Gantt chart. To get the best performance and results from resources, you must manage resource workloads to avoid overallocations and underallocations. A project manager’s worst nightmare is the end date slips after you make changes to the schedule. Learn strategies to take control of the project’s end date. Communication is often difficult, especially when you’re reporting bad news. To help you communicate with your stakeholders and executives, Project has attractive, professional reports that you can create and send in a few simple steps. Are you going over budget? Do you need to adjust costs? Find out how to solve cost problems in your schedule. Earned value is an advanced tracking method. But it isn’t just for experts. You can use it, too, to help you monitor your project. Risks are everywhere in your project. Identify the trouble spots early and respond to them before they get you into big trouble. Project provides tools to help you manage cross-project dependencies, even tasks in one project that are dependent on the completion of another project.